Canadians from coast to coast are joining together this month to mark International Development Week, from February 4th to 10th. This is a uniquely Canadian tradition, dating back to its establishment in 1991. It’s designed to celebrate Canadian contributions to poverty reduction and to engage others in learning about – and contributing to – those efforts. It’s a great opportunity to raise our voices and grow our movement! This year’s theme is “Partners for a Better World,” encouraging all Canadians to be partners in building a more inclusive, peaceful, and prosperous world. There are many examples of how Canadians draw on the power of partnership to promote equality and prosperity across the globe. The RESULTS model itself is a beautiful example of partnership for a better world. Locally, we come together to support and strengthen the advocacy of our neighbours at group meetings. Nationally, we join forces with our fellow citizens on calls, at conferences, and through virtual conversations. Globally, we strive to learn from – and amplify – the voices of our partners all over the world through the ACTION Global Health Advocacy Partnership. This month, let’s grow our impact by sharing the power of the partnerships we build at RESULTS with our networks! Tell your MPs, your friends, your neighbours, your colleagues, your families, and the public about the incredible work we’re doing together. 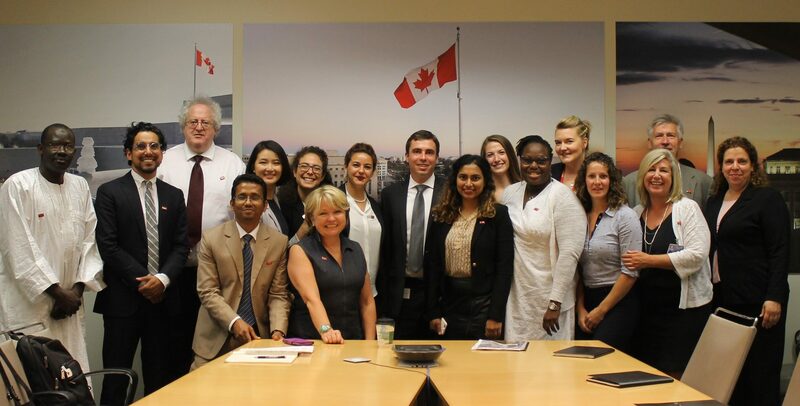 With strong support and encouragement from advocates across the country, Canada has embraced partnerships with civil society, multilateral organizations, and national governments across the globe to work towards a more equitable and prosperous world. What has Canadian international assistance helped accomplish in a year (based on 2015-2016)? And so much more! We can accomplish incredible things with the right partnerships! But while we celebrate these achievements, let’s not forget there’s still a lot of work to be done. 1 in 5 infants still misses out on routine immunizations, resulting in 1.5 million deaths in children under five every year that could have been prevented by vaccines. Undernutrition still causes stunted growth in nearly a quarter of the world’s children. There are still over 260 million children and youth who can’t go to school. The list goes on. We’ve made enormous progress but we can’t be complacent. Canadians are proud of their commitment to global development. We play an important role on the world stage, and our government has voiced a strong desire to support the world’s most vulnerable people. However, Canada needs resources that match our ambitions. Canada’s international assistance is a defining feature of our global presence. It lets us support crucial programmes for global health, nutrition, and education, among other important issues. But at just 0.25% of our gross national income, our Official Development Assistance (ODA) budget is at the lowest percentage it’s been in decades (as we saw in December’s action sheet). This has negative implications for Canada’s global leadership, and limits our impact. A declining rate of ODA forces decision-makers to make tough decisions about where to put limited resources. They must choose between life-changing initiatives affecting millions of people, supporting some with money taken from others. We need more ODA. This month, as we celebrate all that we have achieved together, the Government is also finalizing Budget 2018. We must demand that the Budget provide the additional resources required for our international assistance to strengthen and enhance Canada’s global commitments. See the list of events happening across Canada here, or check your provincial Council for International Cooperation and universities near you for local events! Share your experiences with RESULTS Canada and connect with others working towards the same goals. With International Development Week this month, it’s a perfect time to reach out to media about the value of international assistance. Celebrate Canada’s achievements and call for more resources in the upcoming Budget to fill the global funding gap that still exists in supporting the world’s most vulnerable people, as recommended by the House of Commons Committee on Finance (recommendation 85 in their Report). Check out our tips for how to get published here. This month is a great time to let your MP know about Canadians in their constituency and across the country that celebrating Canada’s global achievements and encouraging even stronger commitments from the government. Use these resources for support on influencing your MP! World TB Day is fast approaching – it’s on March 24th. Join with other advocates across the country to light up a monument or building in your town to mark the occasion. Email [email protected] to find out more!